The suspect in the Pittsburgh synagogue massacre was indicted by a federal grand jury Wednesday, and members of a grief-stricken Jewish community endured another round of funerals for victims of the worst anti-Semitic attack in American history. Robert Bowers, a 46-year-old truck driver who authorities say raged against Jews as he gunned down 11 and wounded six, was charged in a 44-count indictment with murder, hate crimes and other offenses that could bring the death penalty. The indictment, which was expected, was announced on the second day of a weeklong series of funerals for congregants who perished in the mass shooting at Tree of Life synagogue. "Today begins the process of seeking justice for the victims of these hateful acts, and healing for the victims' families, the Jewish community, and our city," U.S. Attorney Scott Brady said in a statement. "Our office will spare no resource, and will work with professionalism, integrity and diligence, in a way that honors the memories of the victims." One after another, services were held for three more victims of the rampage: Joyce Fienberg, 75; Melvin Wax, 87, and Irving Younger, 69. Here are photos of those killed in the Pittsburgh synagogue shooting. Click to read about each person. "It can't be fixed," Robert Libman said at his sister's funeral, clutching his chest as he described the pain of losing her. "My sister is dead. My sister was murdered. There was no one I know like her. Pure goodness. ... She was the most tolerant and gentle person that I've ever known." Fienberg's sons, Anthony, of Paris, and Howard, of Vienna, Virginia, said she spent five years caring for their father as he battled cancer, then, after his death a few years ago, devoted more of her time and energy to Tree of Life. She was a retired researcher at the University of Pittsburgh. "My mom would be very angry that her funeral wasn't able to be at Tree of Life, and that her friends lost Saturday couldn't be here," Howard Fienberg said. Younger had a small realty office in Squirrel Hill, the heart of Pittsburgh's Jewish community, and coached baseball for more than 20 years. He loved to talk, and would gladly share his life story or stop strangers on the street to show them pictures of his grandson in California. One friend called him "a kibbitzing, people-loving man." Widowed a decade ago, Younger had a son and daughter in California, who waited all day Saturday to learn if he had survived. "That waiting stage was just unbearable," said his son, Jared, of Los Angeles. "Saturday was the most lonely day of my life." Jared Younger said that when his sister contacted him, he had a feeling it was about his father. Irving Younger hadn't been in great health, undergoing bypass surgery last year. Jared Younger said his dad drank Diet Coke for 40 years, quipping he was "anti-water." 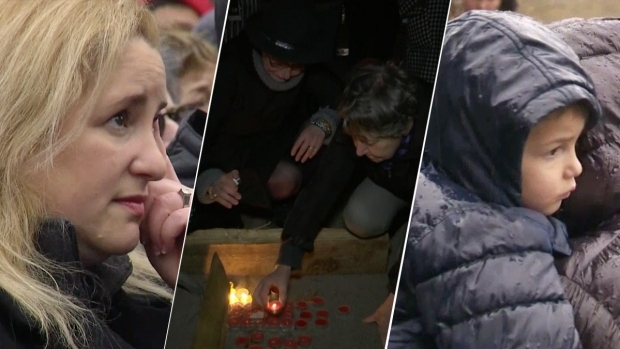 People gathered in cities across the United States, as well as abroad in Canada and France, to remember the victims of a deadly shooting in Pittsburgh's Tree of Life synagogue that took 11 lives. The day's other funeral was held for Wax, a retired accountant who was regarded as a core member of the congregation at New Light, which rented space in the lower level of Tree of Life. A drained-looking Tree of Life Rabbi Jeffrey Myers, a survivor of the weekend shooting, hurried from service to service. "I can't imagine the stress he's under," said his predecessor, Rabbi Charles "Chuck" Diamond. 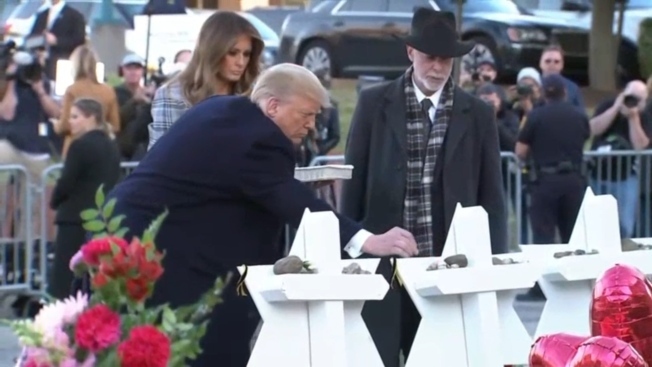 As Younger's service was wrapping up, Myers momentarily forgot to read a letter to his family that another rabbi had sent. "After preparing for five funerals, you get a little verklempt," Myers said. Bowers remained jailed without bail ahead of an arraignment scheduled for Thursday.